she who eats: unfamiliar combination of familiar items? unfamiliar combination of familiar items? Today I was too busy to make anything fancy, too hot to use the oven, but too tired not to have something nice and refreshing - so I made coffee jelly, or coffee gelatin dessert. It has definitely a lot to do with my childhood memory of summertime. My sister and I would make a large bowlful of coffee jell-o - no sugar or milk, please -, scrape it out as much as we wanted and ate it with condensed milk, or more likely milk and sugar. It was nice soothing company to survive a dreadful Tokyo summer. I made just a large mug of coffee and put unflavored gelatin in it to dissolve, and then chilled it in the fridge. It disappointed him a lot when he came home and went into the fridge and said, "dessert! dessert!" and learned it was coffee jell-o. He was so disappointed he even sniffed at the jell-o to make sure it was coffee and I wasn't fooling him. 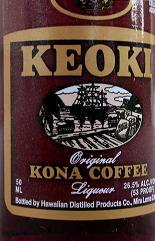 Today I tried a Hawaiian coffee liquor with the jell-o (which was fine), and of course with milk and sugar (I usually don't have sugar in my coffee or tea, but this is another thing). 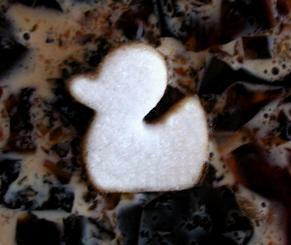 For fun, I put some sugar duckys on the jell-o, too... (they sank fast, though). no sugar monkeys to decorate the jelly? hmmm...? did you see this? we're on the same page with dear nicey! could the nice cup of tea and tasty snack tour be far off? i think not. sugar duckies! i have never seen anything like that before. fascinating! :) the coffee jello sounds very refreshing. im betting americans would think ew gross because when they think of coffee its not automatically sweetened... so they probably think of cold bitter coffee. im sure if you add a metric ton of sugar they'd be thrilled! omg, chika, you kill me! And thanks for the link, I didn't know about it and very thrilled to find it. I'd be on that tour, for sure! Santos - Thanks a bunch! Can I have seconds? Linda - of course not, thanks! Coffee Jelly is good, very yummy and refreshing. I don't like coffee but I will gladly eat coffee jelly. With sweetened milk. Funny thing you don't like coffee but still like coffee jelly... well, they're different, I agree. With sweetened milk, of course! Dear Chika, I am a coffee jelly fan after being served an exquisite tiny square in a coffee shop in Kuala Lumpur. I came searching for recipe, I think the one I am looking for was probably made with agar agar, it melted in the mouth and was perfect for a hot day. Then again, I come from Melbourne and anything with coffee in it has to be great, we are a city fixated, and Starbucks comes nowhere near close. I had coffee jello in japan and was excited to come across the coffee jello frappuchino in japan as well!! Especially with the popularity of bubble teas, I too am shocked coffee jello has not made a comeback...yes, a comeback, here in the US. According to my father, my grandmother used to eat coffee jello all the time when he was young!! The worst part of the coffee jello frappuchino? I discovered it Nagoya airport on my way home =( Well, I will be sure to make coffee jello here at home and drinking plenty of coffee jello frappuchinos upon my return to Japan next year!!! mm.. coffee jello.. i was introduced to it as a dessert at Sawtelle Kitchen which is this restaurant in LA. they also serve it with coffee ice cream on top, which is a surprisingly good combination. What is the gelatin to coffee ratio and do you have a recipe using agar agar? Where did you get the sugar duckies?! Coffee jelly! Fantastic! Starbucks brought it in for a while to Singapore then yeah it disappeared. Really loved it though! 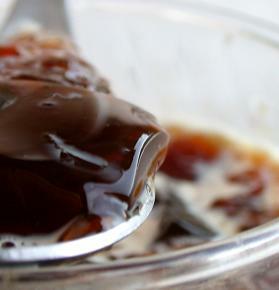 Ooh - I know this is old, but I've been searching for a coffee jello recipe using agar-agar. I lived in LA and we ate it in Japanese restaurants frequently and my mom would make it at home - unsweetened jello with a scoop of vanilla and some simple syrup. I don't drink coffee as an adult, but this is delicious - I miss it. I'm Chika, and this is a little place of mine where I write about food I've had, places I've been to, and other things I've come across in my everyday life, in Japan and elsewhere. (c) 2004-2015 she who eats. All rights reserved. No content on this website including, but not limited to, text and photography may be reproduced without prior explicit written consent from the copyright holder.